Then Devin Patrick Kelley, 26, allegedly opened fire on a small Texas church on Sunday morning, killing 26 people, wounding at least 10 others and providing the two-gas station community of Sutherland Springs with a grim distinction. “We are dealing with the largest mass shooting in our state’s history,” Gov. Greg Abbott said at a news conference. Ann Stefanek, a spokeswoman for the Air Force, confirmed that Kelley was court-martialed in 2012 on two charges of assaulting his spouse and their child. He was confined for a year, given a bad conduct discharge and reduced in rank to E-1, or airman basic, Stefanek said. A search of criminal records in Comal County, where Kelley lived, yielded only minor violations — driving with an expired registration, speeding, failure to stop at a stop sign, driving without insurance. A New Braunfels Independent School District spokeswoman confirmed that Kelley graduated from New Braunfels High School in 2009, but declined to offer additional details about him. “This senseless act of violence is something that is hard to understand and has definitely shaken our community,” the spokeswoman, Rebecca M. Villarreal, said in a statement. 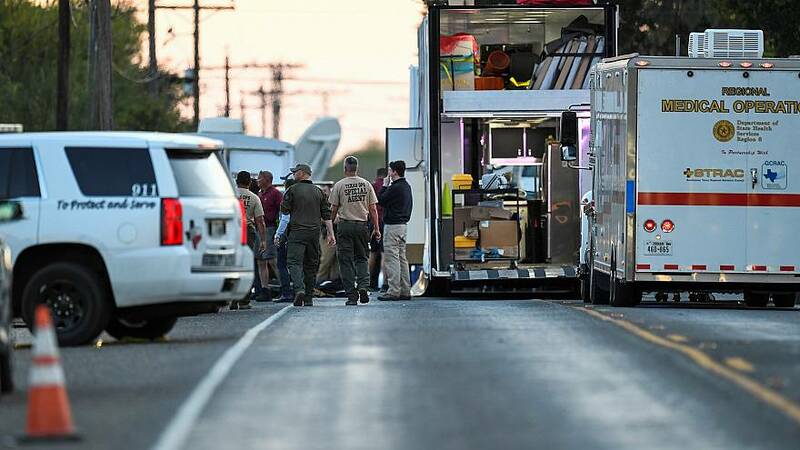 Martin told reporters that Kelley was wearing the tactical gear and the ballistics vest when he pulled into a gas station in Sutherland Springs at 11:20 a.m. (12:20 p.m. ET) Sunday. He had multiple weapons in his car, Martin said. Martin didn’t provide additional details, but he said Texas Ranger bomb specialists were processing the car. After leaving the gas station, the gunman crossed the street, got out of his car and sprayed First Baptist Church’s right side with his rifle, Martin said. He then entered the church and continued to fire until a local resident grabbed Kelley’s rifle, forcing him to drop it and flee. The resident pursued Kelley, who drove off the road and crashed, Martin said. Kelley was later found dead, Martin said, although it was unclear how he died. “We don’t know if it was a self-inflicted gunshot wound or if he was shot by our local resident who engaged him in gunfire,” he said.